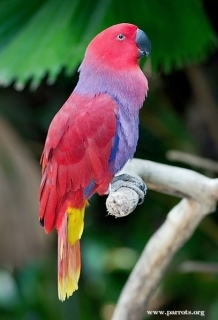 In Eclectus Parrots, sexual dimorphism (differences between male and female) are more marked and striking than in any other parrot: males are generally green in colour, females red. E.r. roratus (Grand Eclectus): Male-green with red underwing coverts to sides of belly; central tail feathers green above and tipped yellow/white, side tail feathers green and washed blue above and tipped yellow/white; undertail grey tipped yellow/white, upper mandible orange tipped with yellow, lower mandible black. Eye orange. Female-body red with dark brown/red on back and wings; underwing coverts to lower breast, abdomen and wide band across mantle soft purple; red of upper breast washing into purple of lower breast; bend of wing lilac/blue; undertail coverts red with longer feathers tipped yellow; tail red tipped orange/yellow. Bill black. Eye yellow/white. E.r. vosmaeri: Male-as in roratus, but head, neck and undertail coverts more yellow; side tail feathers blue edged with green; larger in size. Female-as in roratus but undertail coverts yellow; tail widely tipped with yellow; larger in size. E.r. westermanni: Male-as in roratus, but smaller in size; plumage generally duller, more blue/green; less red on sides of lower body. Female-as in roratus, but smaller in size. E.r. cornelia: Male-as in roratus, but head, upperparts and neck paler green; tail strongly washed with blue; larger in size. Female-entire body red with lilac/blue underwing coverts; larger in size. E.r. riedeli: Male-as in roratus, but neck and lower cheeks more blue/green in colour; tail widely tipped with yellow; smaller in size. Female-as in cornelia but undertail coverts yellow; tail widely tipped with yellow; smaller in size. E.r. polychloros: Male-as in roratus but head and neck darker green; tail green tipped with yellow/white, the side feathers blue tipped yellow/white and washed with green on outer webs; larger in size. Female-as in roratus, but brighter red on head and upper breast; eye ring feathered and blue; underwing coverts to lower breast and abdomen as well as stripe across mantle deep blue; red of upper breast not washed into blue lower breast; undertail coverts red; tail red tipped with orange. E.r. biaki: Both adults as in polychloros, but smaller in size; in female hindneck and upperparts brighter red. E.r. aruensis: Both adults as in polychloros but tail in male more widely tipped with yellow and female’s tail brighter red. E.r. macgillivrayi: Both adults as in polychloros but larger in size and with longer tail; less yellow tinge to green body colour of male. E.r. solomonensis: Male-as in polychloros but green plumage more yellow, particularly on head and neck; outer webs of primary feathers more bright lilac/blue becoming deep blue toward tips; smaller in size. Female-as in polychloros but head and breast brighter red; underwing coverts to lower breast, abdomen and wide band on mantle deeper blue, less purple; outer webs of primary feathers more bright purple/blue, becoming deep blue toward tips; smaller in size. As in adults but duller; in both sexes upper mandible dark brown/grey tipped yellow. Eye brown. In flight: loud, rough screech repeated continously or in short bursts. Various alarm calls, more mellow calls and a bell-like sound possibly heard before mating. 3 of subspecies common in aviculture: E.r roratus, E.r. vosmaeri, E.r. polychloros; other races rare. Fruit, any type but especially apple, pear, orange, cactus fruits, pomegranate, banana, forming about 30 percent of diet; fresh vegetables especially carrot, celery, green peas, beans, fresh corn and green leaves. Cooked/sprouted beans or pulses. Spray millet, mix of small seeds (canary, millet, small amounts of oats, buckwheat, safflower, limited sunflower) and complete kibble. Destructive toys, branches, puzzle toys, bathing, peek-a-boo games, swings, ropes. 30cm (11.7") square and 1.2m (4 ft) high, or 12"x 12"x 24" (30.5cm x 30.5cm x 61cm) vertical box. Unknown, decreasing. Sumba population about 1900 individuals. Local trapping has caused the extinction of this species on Ambon, Saparua and Haruku. Sumba population endangered. E.r. roratus: Buru, Seram, Ambon, Haruku and Saparua, S Moluccas. E.r. vosmaeri: Morotai, Loleda, Besar, Dagasuli, Halmahera, Damar, Ternate, Mare, Kayoa, Bacan and Obi, N Moluccas. E.r. westermanni: Unknown; birds described are of captive origin. E.r. cornelia: Sumba, Lesser Sunda Islands. E.r. riedeli: Tanimbar Islands, Indonesia. E.r. polychloros: Kai and W Papuan Islands, Indonesia, east through New Guinea; Boigu, Dauan and Saibai Islands, northern Torres Strait Islands, Australia, to Trobriand Islands and D'Entrecasteaux and Louisiade Archipelagos, E Papua New Guinea. E.r. biaki: Biak Island, in Geelvink Bay, Irian Jaya. E.r. aruensis: Aru Islands, Indonesia. E.r. macgillivrayi: E Cape York Peninsula, Queensland, N Australia, from Pascoe River south to Massy Creek and McIllwraith Range. E.r. solomonensis: Admiralty Islands and Bismarck Archipelago to Buka and Bougainville Islands, E Papua New Guinea, and Solomon Islands. Found in wide range of habitats from forest to secondary growth forest, savanna, mangrove, coconut plantations and Eucalyptus woodland, up to 1900m (6232 ft). Most common in lowland forest, coastal areas and around cultivation. Consists of fruits, berries, nuts, seeds of Eucalypt and Acacia in particular; nectar, leaf buds and blossoms. Birds are found singly, in pairs or small groups. Often found soaring high above the forest calling loudly. Wary; foraging groups found in treetops. Mostly active at dawn and dusk traveling to and from roosting areas where up to 80 birds will settle in for rest. 2, broad, ovate shaped, 40.0 x 31.0 mm (1.5 x 1.2 in). Any time of year in Papua New Guinea; Australia, July-February; Buru, November; Seram, August; Solomons, July-September.